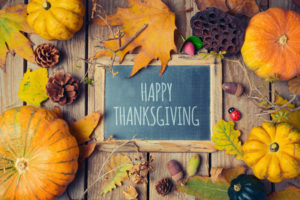 Happy Thanksgiving From the Team at Abbate Insurance! The team at Abbate Insurance would like to wish you and your loved ones a happy and safe Thanksgiving! Since it’s the season of giving thanks, we’d also like to extend a huge thank you to all of our clients and their loyalty. As an independent insurance agency, we value every one of our clients, thinking of them as extended members of the family. Because of your dedication and trust in us, we are able to serve you and your loved ones every day with quality insurance. Thank you for the opportunity to do so! Happy Thanksgiving from all of us at Abbate Insurance!